We are honoured to have been included as the production supplier for Madame Mayor Hazel McCallion’s Retirement Gala. This wonderful event took place on September 27th at the International Centre and commemorated Mayor McCallion’s remarkable 12 Mayoral terms spanning over 5 decades. This event was hosted by News Anchor Francis D’Souza and Olympic Gold Medalist Cheryl Pounder and included performances by Chuck Jackson, Shannon Butcher, Michael Ciufo, Nicholas Cunha and Nancy Walker among many others. 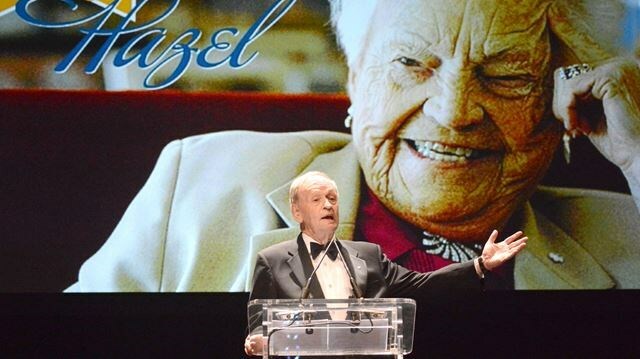 Over 1100 supporters attended to honour Mayor McCallion’s remarkable journey and legacy. We provided production including, line array audio, moving lights and a custom design for the stage. Special thank you to Madame Mayor Hazel McCallion and all of the wonderful things that she has done for us and especially the Mississauga community!